Family Day Long Weekend - ay jay kay squared.ay jay kay squared. Our long weekend was different than most other people’s this time around. Andy works on Sundays for the next few months, so he took Thursday – Saturday off instead. Turns out that Spencer and I caught bad colds somewhere along the way and were reasonably miserable starting Friday. So it turned out that Andy, indeed, caught it along with Cassia, and he ended up needing to take yesterday and Tuesday off as sick days. We are slowly recovering, but none of us are in full spirits yet. Us being sick over the weekend did not prevent him from finishing up our fabled-until-now custom made wine rack! You truly have no idea how excited I am for this sucker. It has wheels! We are guesstimating that it can hold 100 wine bottles and 3 boxes of wine. Stellar! We just have to find a staple gun to attach some grip stuff to the pillars so that the wine doesn’t slip, then it’ll be done! Huzzah! I plan on painting it this summer, which will definitely be a crazy project, but will be well worth it. What colour do you think it should be? I was determined this weekend to clear off my sewing machine table, remove the old and put in the new. I even did it successfully! However, in doing so, all the junk crafting materials that were piled on the table were redistributed throughout the floor. 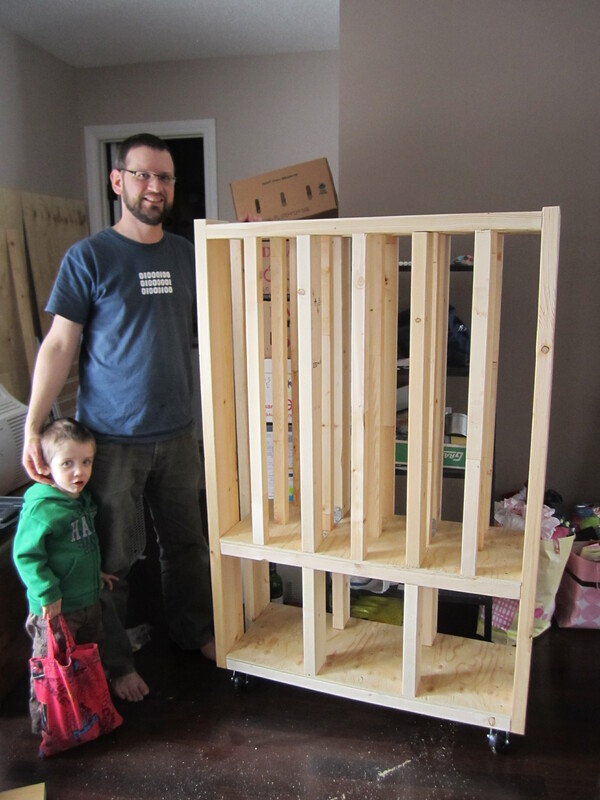 So, I asked Andy if he could help me to put up the final installment of shelves that were meant for my sewing stuff. And like the awesome husband that he is, he put them up for me! 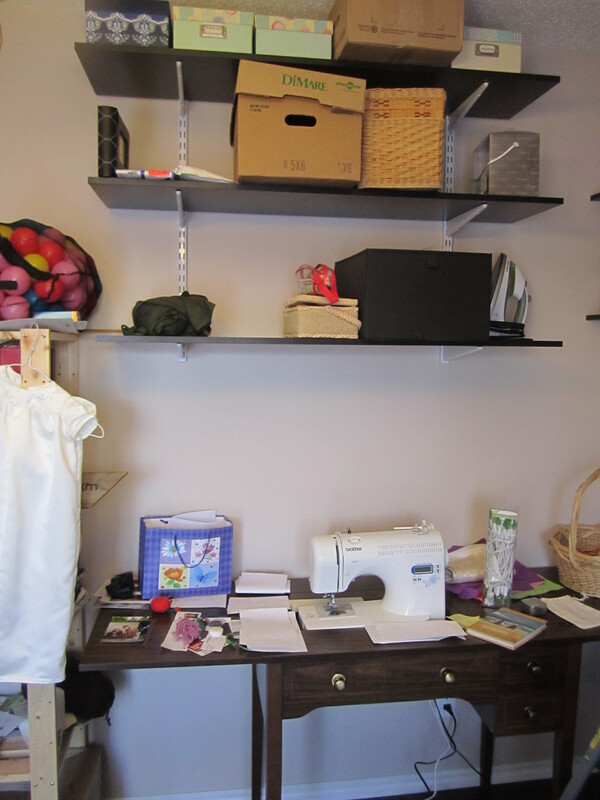 So now my sewing stuff is no longer strewn upon the floor or in messy piles on my sewing table – it is properly up on shelves now! I’m scouring pinterest for ideas on what I can do for underneath the shelves that’s creative, inspiring, and practical. Haven’t found anything yet. Ideas? I’m so excited for my new space! It’s never felt so clean and tidy in here! I’m so itching to get into it and sew something, but I have a couple non-sewing projects on the go right now and I can’t find the time to set aside to learn this new fangled contraption. Maybe this weekend I can find that time I need. I’m just so thrilled at how productive this weekend was, despite being miserable and sick. At least it wasn’t the stomach flu. We are thankful for our blessings. How was your weekend? Weekend of FUN! Is it the weekend yet? Ham Weekend! Long Weekend Away! This entry was posted in Uncategorized and tagged crafts, long weekend, sewing, sick, wine. Bookmark the permalink.